In ALPHA GIRL, Judith is the last woman left standing when a cosmetic company’s new product turns the world’s women—and only women—into man-eating zombies. 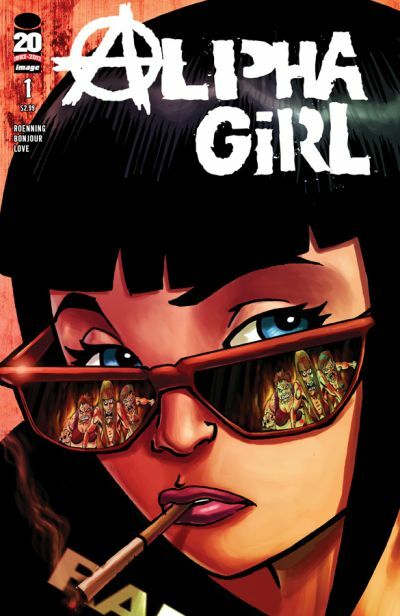 Retailers pursued the first issue of the new Image Comics series with equal voracity, as ALPHA GIRL #1 sold out in the week leading up to its release. ALPHA GIRL will continue Judith’s quest to rescue her little brother from the ravenous horde, keep her status as the last uninfected woman on earth, and quite possibly save the world as well with issue #2 (JAN120575), in stores on March 14. The creators of ALPHA GIRL are celebrating the launch of their new series with a party and books signing at Meltdown Comics in Los Angeles on February 2, featuring cocktail mistresses Alie and Georgia, Sean Patton, sketch group Diani and Devine, DJ Douggpound, Steve Agee, and Margaret Cho. Tickets are available at NerdMelt.